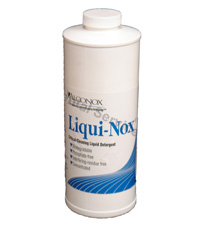 Liquinox is a concentrated, anionic detergent for manual and ultrasonic cleaning. Free rinsing to give you reliable results without interfering residues. Extremely mild and completely soluble in hard and soft water. USDA authorized. Dilute 1:100. pH 8.5. Surfaces cleaned:Corrosion inhibited formulation recommended for glass, metal, stainless steel, porcelain, ceramic, plastic, cement and fiberglass. 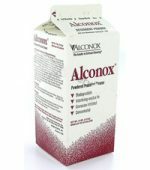 Can be used on soft metals such as copper, aluminum, zinc and magnesium if rinsed promptly. Used for art restoration. Corrosion testing may be advisable.